Somebody said to me the other day that F1 is having one helluva season; that is fast becoming an understatement. With Alonso delaying Hamilton's final pit stop in qualifying by waiting several seconds before moving off from his own, yet another talking point is created. Going on the theory that any publicity is good publicity, it is hard not to suspect that Bernie Ecclestone is somehow behind all this. To be serious, however, was the delay deliberate on Alonso's part or not? Consensus on the net is that it was; Alonso says no, it was the team's fault. My own position at present is that I don't want it to be a ploy by the Spaniard but it certainly looked that way. No doubt there will be arguments for years over the truth of the matter. Hamilton: "I'm not angry. I'm curious as to what's gone on and I find it quite interesting and amusing," he added. "But the good thing is that we have the pace and we did a great job." 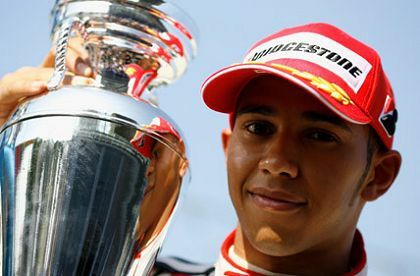 There is no longer any doubt about it, Lewis is a star such as we rarely see in F1. I can think of no other driver amongst the present crop who would react so calmly and with such maturity (well, maybe Alex Wurz, but when will he ever be in a similar position?) - the guy had a broad grin on his face as he spoke, for crying out loud! It is only a pity that the British press will make so much of a meal of the incident that Lewis' response will be lost amongst the garbage. I fully expected Alonso to put Hamilton in his place by grabbing pole position for this race; but the young Brit looked so fast in Q1 and Q2 that I feared for my prediction. Lewis is all that everyone says he is and much more. No, he is not the new Schumacher - he is better than that. Even without the McLaren incident, there was plenty to talk about in qualifying. Nick Heidfeld took third spot on the grid, a magnificent effort from both the driver and the team. I suspected that Hungary would be the place for BMW to get amongst the big boys at last and so it has proved. Kimi Raikkonen did his best with a Ferrari that looked none too happy but had to be content with fourth. And Massa had his chances ruined by a mistake in his final pit stop in Q2. Left with just one lap to set a time good enough to progress to Q3, he tried too hard and finished in 14th. At least it means he can impress the crowd with some dramatic overtaking tomorrow. Notice, too, that Nico Rosberg came through to 5th on the grid. The Williams is good but not that good and I can only hope that Nico gets the reward he deserves for his efforts with a really good finish in the race. Ralf and Trulli managed to get their Toyotas into the top ten, 6th and 9th respectively, but previous race performances inevitably cast doubt on their ability to stay in those places when the race begins. So there we have it, a dramatic and incident packed qualifying session that is great for F1 in some ways and awful in others. For once, let us concentrate on the good and tip our hats to Lewis Hamilton. He did himself nothing but good today and is the best thing to happen to the sport in years. And I don't care if I sound like the tabloid press in saying that - it just happens to be true. It will ceratinly be interesting how today's events affect the two drivers going forward. Thank you, Punter, much appreciated. I'm not a betting man but I must say that your site is excellent for those who fancy a little flutter. Interesting design too - four columns is unusual but works well on your site. I have been waiting to see how Hamilton turns out, Monstermom, but I think this qualifying session has decided me. It has been obvious for some time that he has the speed but now it appears he has the character too. I see the stewards have decided that it was a blocking incident and they have penalized Alonso five places. He will start the race tomorrow from sixth position on the grid. And, slightly surprisingly, they have declared that McLaren will take no constructor's championship points from this race. They're an unpredictable lot, aren't they?